Although flaxseed has been cultivated for centuries, it’s recently become extremely popular because of its numerous health benefits. This tiny seed packs a big nutritional punch! Although flaxseed has been touted to cure just about every disease from diabetes and heart disease to cancer, the full effects of flaxseed in the human body are still not completely known and more studies are needed. Here is a link to the evidence on the effects of flaxseed on various medical conditions from the Mayo Clinic. What is known for sure is that flaxseed is rich in several important compounds including omega-3 fatty acids, fiber, and phytochemicals, all of which have very important health benefits and should be included in a nutritious diet.Flaxseed can be purchased at most natural foods stores or health food stores and comes whole, ground (milled) or as an oil. It also comes in golden or brown varieties but there’s no nutritional difference between the two. Whole flaxseed has a tough exterior, which makes it difficult to digest, so it tends to pass through the body without giving you much of its nutritional benefits. The ground form is absorbed better by the body and provides much more health benefits. Pre-ground flaxseed however, has a short shelf life so the best idea is to buy it whole and grind it up in a coffee or spice grinder as you need it. You can store unused flaxseed in a cool, dry place or in the refrigerator. 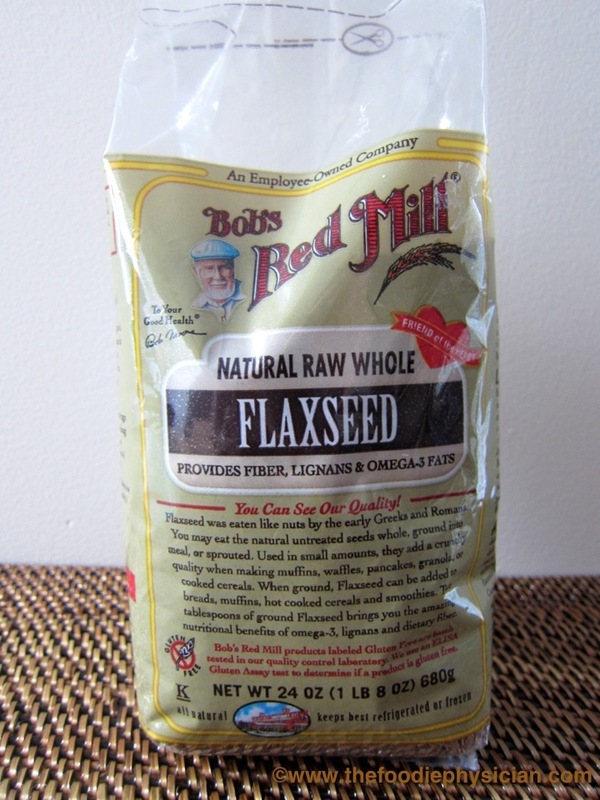 Flaxseed is high in protein and can be sprinkled on many foods like yogurt or oatmeal. It also can be stirred into hot soups, stews and pasta sauces. It can even be used in baking and can be incorporated into cakes, cookies and muffins. It’s also a great addition to smoothies to add extra fiber and protein. To reap all of the health benefits of flaxseed, it’s recommended that you eat 1-2 tablespoons a day. 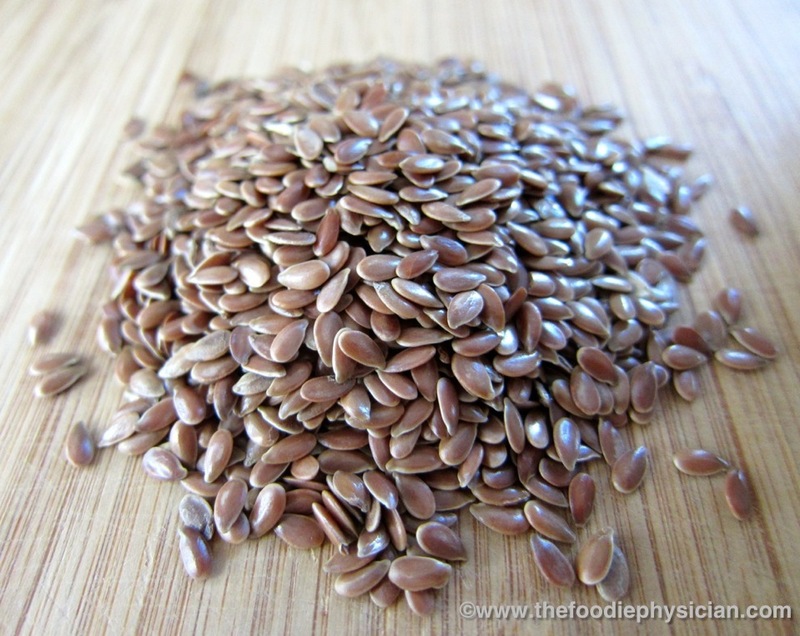 – Fiber: Flaxseed is high in soluble and insoluble fiber. A diet high in fiber has several health benefits including helping to reduce cholesterol levels, regulate blood pressure and promote heart health. Fiber also helps to regulate blood sugar levels. It’s also really important in maintaining bowel integrity and regularity. It may also play a role in preventing colorectal cancer but the evidence is mixed. – Omega-3 Fatty Acids: Omega-3 fatty acids are essential compounds that our bodies need to function. However, because we don’t naturally produce omega-3s, we must get them from our diet. Flaxseed contains high levels of alpha linoleic acid (ALA), an omega-3 fatty acid that is partially converted to the omega-3 fatty acids (EPA and DHA) that are mainly found in fatty fish like salmon. Omega-3s have been shown to have incredible health benefits. They reduce the risk of death from cardiovascular disease by several different mechanisms including lowering triglycerides and reducing blood clotting. They also are important for neurologic development, especially in fetal development and young children. They may help reduce the risk of dementia in the elderly but more studies are needed. Because they work to reduce inflammation, omega-3s may improve symptoms in diseases such as arthritis and asthma. Other good food sources of ALA are canola oil, soybean oil and walnuts. Of note, flaxseed oil contains omega-3s but does not have the fiber and lignans found in the rest of the seed. Now you know why I said this amazing little seed is packed with nutrition! 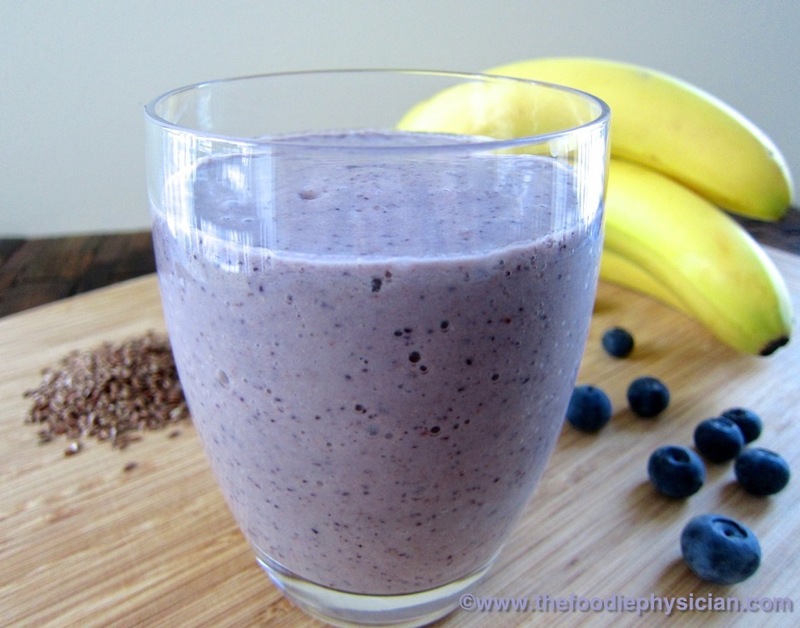 If you’re looking for an easy way to incorporate flaxseed into your diet, try my Blueberry Banana Flaxseed Smoothie. Blueberries, another superfood, are higher in antioxidants than any other fruit. They’re also packed with fiber and several vitamins including Vitamin C. Greek yogurt adds tangy flavor and a boost of protein while the bananas, honey and almond extract add sweetness. Throw in some flaxseed and it’s the perfect, nutritious drink to get you going in the morning or anytime of day. Enjoy! Yes, me too- I like the slightly nutty flavor it adds. Thanks, Debi! I love Thursday's Treasures- so many great recipes! I adore blueberries but, for some reason, rarely use them in smoothies. You have inspired me! Looks refreshing and delicious! Thanks, Ann! 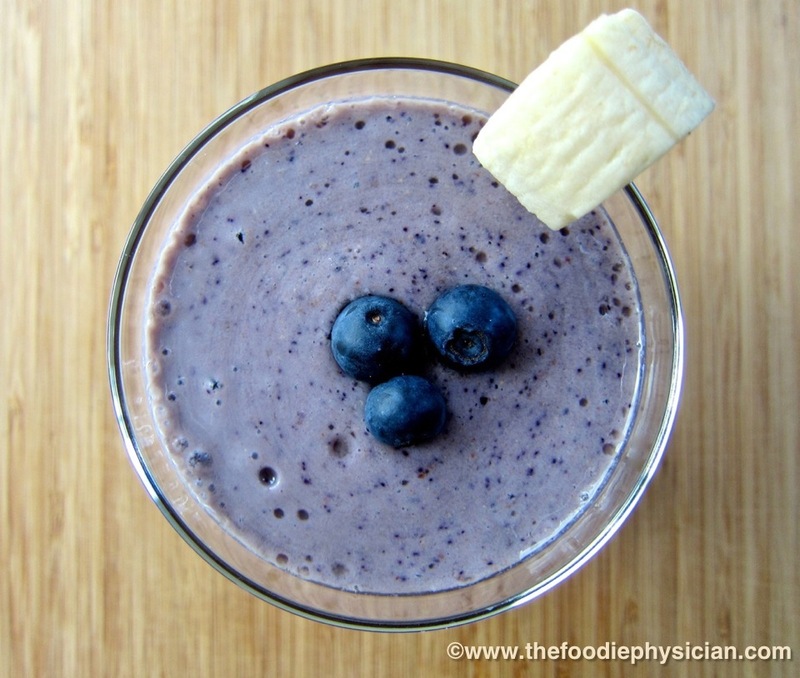 Blueberries are so good for you and smoothies are a great way to use them. I linked up this post with two great sites- Recipes for My Boys (http://www.recipesformyboys.com/2012/06/thursdays-treasures-week-40.html) and Amee's Savory Dish (http://www.ameessavorydish.com/2012/06/fit-and-fabulous-fridays-38.html). I've recently become obsessed with flax seeds! I love to put ground flax seeds in my oatmeal, smoothies, and yogurt and even in breading for baked chicken – besides all of its health benefits I love how full it makes me feel. Thanks for a great, informative post! Thanks, Katherine! Great idea to use flaxseed as a breaking for chicken- ill have to try that next! That's great Amee, I'm so glad your readers liked it! What about substituting chia seeds for the flax seeds? I'd like to see if flaxseed can work well as an embolism deterrent at a fraction of a cost of lovenox. 1) If I'm using these in a high-speed blender, for smoothies, do I still need to grind them ahead of time? 2)Is there any benefit to using chia seeds over flax seeds — and if so, is there any reason to use both in a smoothie? Hi David, it's probably not necessary to grind them ahead of time if you're using a powerful blender. But I personally like to grind them in the blender first before adding the rest of the ingredients so that they're ground nice and evenly. Regarding chia seeds, they have a very similar nutritional profile as flax so there's probably no need to use both in a smoothie. They are both great sources of fiber, vitamins and other nutrients. In fact, head to head, chia seeds have even more omega-3 fatty acids, fiber and antioxidants than flax. They don't have the lignans that flax has. Other benefits of chia are that they can be digested whole or ground and they have a longer shelf life than flax. It's still quite surprising that flaxseed's health benefits only recently had some exposure. Then again, it shouldn't be; just about every other healthy food bit just got a bit of the limelight only recently, in light of the call for a sustainable lifestyle. That's true, flaxseed has actually been around for centuries. I'm glad it's finally getting its time in the limelight! Thanks for the great information, Sonali! I didn't realize that whole flax seeds were difficult to digest. I've been putting them into muffins and my oatmeal without grinding them. That will change now, thanks to you! I bet it's darned tasty, though! Thanks for stopping by, Bec! You can try the smoothie without the honey and cut the banana in half to bring down the carbs. Nice blog and great tips for flaxseed. I did not know that flaxseed is so useful. This looks so good. I will definitely be making this recipe! Thanks for great tips for flaxseed. Thanks for your posting. I've tried this before, it's really nice. Nice blog for sharing and following.